Once the warm weather arrives, I know we’ll find ourselves busting out the grill pretty much every night – especially when we’re craving burgers! I love burgers for dinner because they’re simple enough for a weeknight, but still have that magical effect of making the meal feel fun and special. This recipe can be made on the grill – if you’re lucky enough to be somewhere where the weather welcomes that sort of thing – or in a skillet right on your very own stove top. We used the skillet method. It works! 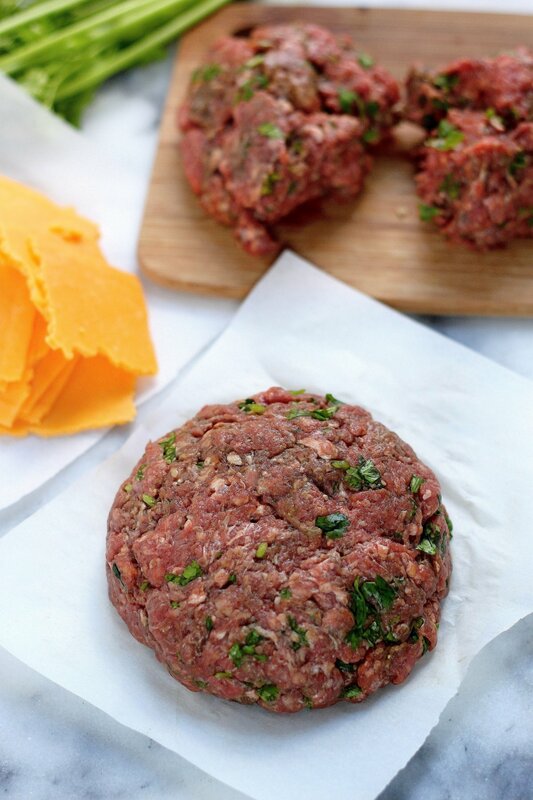 These burgers are spiked with sriracha and stuffed with cheddar cheese – a spicy little twist on the traditional Jucy Lucy. You can also top these with an egg if that’s your thing! I did, and it was SO good. Juicy burgers flavored with sriracha hot sauce and stuffed with cheddar cheese! 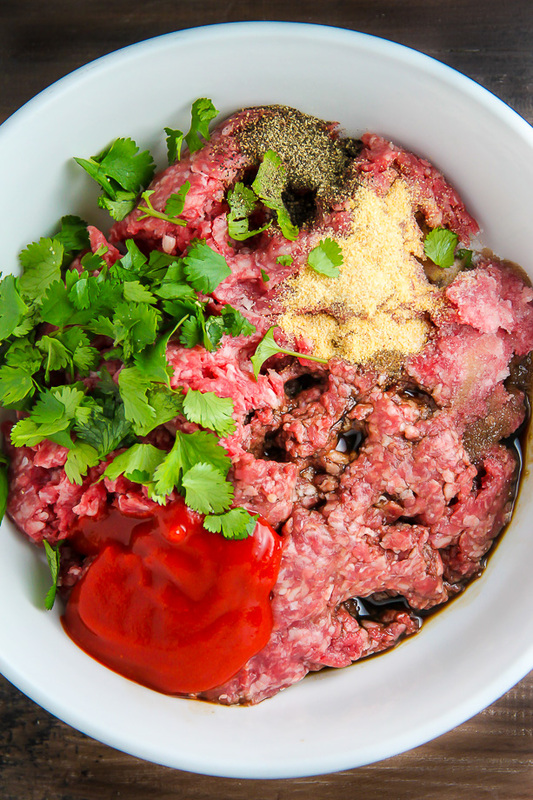 In a large bowl combine ground beef, worcestershire sauce, sriracha, salt, pepper, garlic powder, and cilantro. Using your hands mix until well combined. Divide the meat in 4 balls, then mold each ball into a large patty - the patty should be a little larger than a slice of cheese. Break each slice of cheese in 4 pieces, then place them in two piles with 8 pieces each. Place the stack of cheese in the center of one patty, then carefully place another patty on top of it, sealing the edges VERY tightly. I did this by just pinching them together, but make sure they're really sealed or you'll loose all your cheese while they're cooking. And that would be sad! Repeat process for second burger. Heat butter in a large skillet over medium heat. Once hot, add the burgers and cook for 4 minutes on each side (this will give you a medium-cooked burger, adjust cooking time according to your doneness preference). 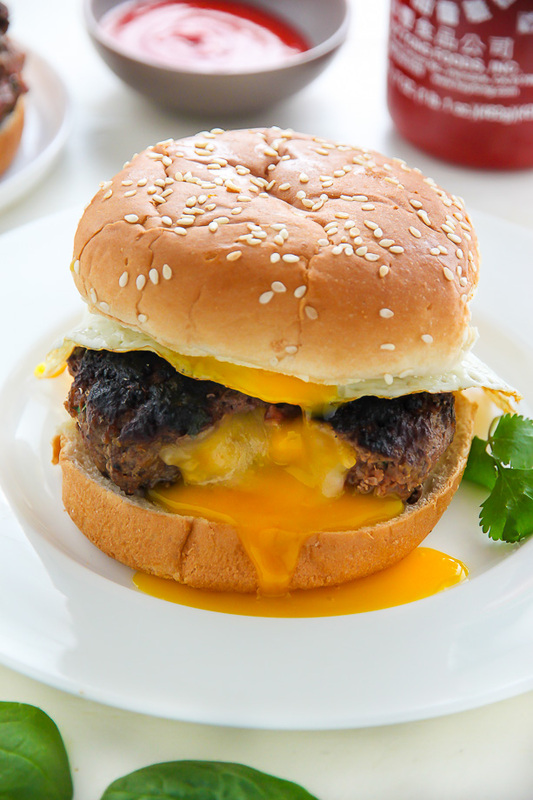 Once the burgers are cooked, carefully place them on the toasted buns, and top with an egg if using. Serve at once! Love the name of this!! Sriracha, cheddar and fried eggs! THIS is my kind of burger! Drool city over here..pinned! I have to make a Juicy Lucy for a client today and you’ve given me some good inspiration to not fear the stuffing of the cheese! And of course, anything with an egg on it is tops in my book. Runny yolk and gooey cheese, my two weaknesses! I am a huge fan of the skillet method! Possibly because the grill intimidates me! These look juicy and so delicious! Oh dear me. I want this immediately! Oh My Gah!! This is killer.. I need to get down with some Juicy Lucy burger action..
All you have to say is sriracha and burger in the same sentence and I’m on it! These look incredible, Ashley! Oooh these are the burgers you were talking about! I LOVE that they’re stuffed with the cheeeese! Never heard of a juicy lucy before but now I am wishing I had one. I love this idea! Love, love, love these burgers! Especially that egg! Ooh, yum! Making my own burgers is one of those things I always say I’ll get around to doing and never do. So this is a great reminder …. especially these beautiful spicy ones with the cheese inside! Will pin for later – thank you! I’m so excited to have a summer of homemade burgers this year – absolutely cannot wait to stuff them full of cheesey goodness like these are! Oh what I wouldn’t give for a grill come summer…I’m just going to have to invite myself over for dinner at your place! 😛 I’m super in love with the fact that there is cheese IN THESE BURGERS. Genius idea. 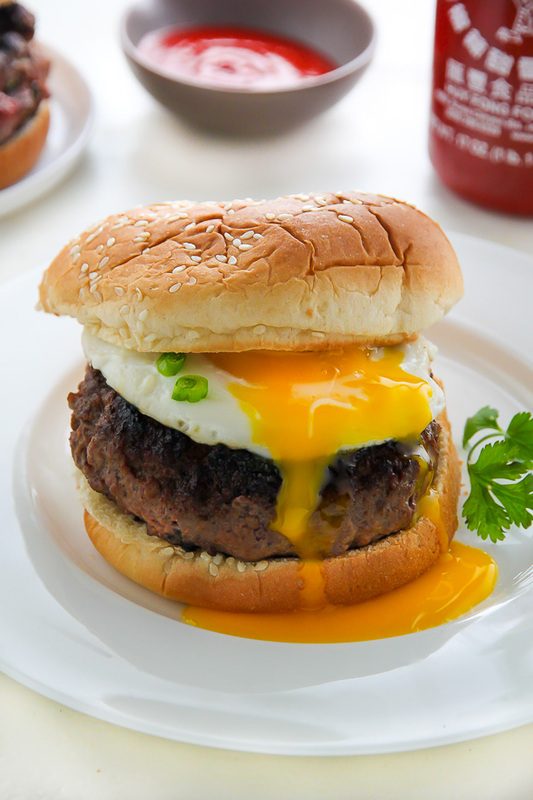 sriracha + runny yolk + cheddar cheese + a freakin burger?! just be my best friend already, would ya? Drool! 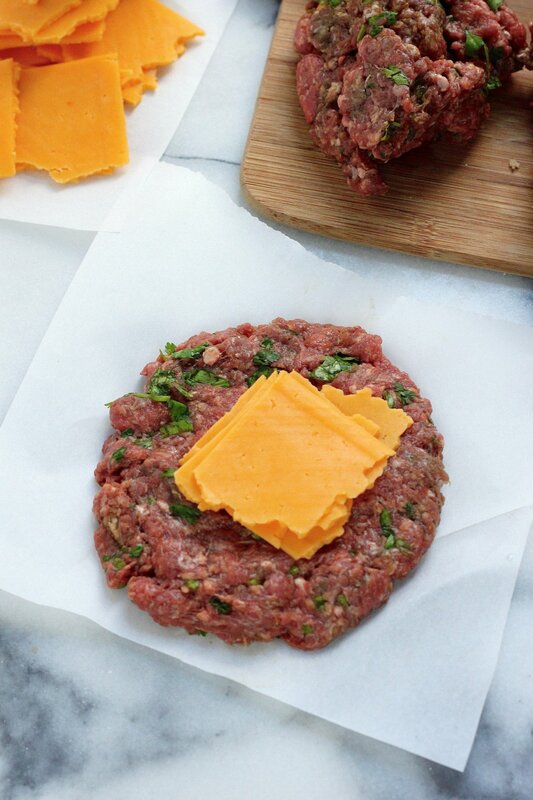 I need to note this recipe and make this yummy burger for my next barbecue. 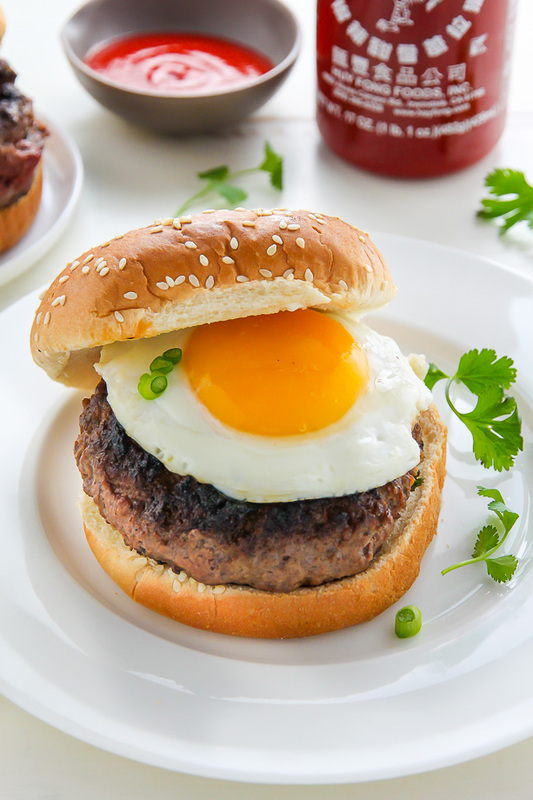 A spicy burger with a runny egg: amazing! My son and I each took down this 1/2 pound behemoth! Delicious! Great burger! !